Aligned with our mission and to reflect the spirit of giving during the holiday season, One World Projects and Charity USA teamed up again this year to support the Believe and Dream Foundation in Bolivia with generous donations. The Foundation was started by one of our in-country coordinators, Mariel Mercado Ramos, and hosts a variety of charitable projects including donating school supplies to children who live in prison with their incarcerated parents, a project to transform discarded plastic bottles into economic opportunities for disadvantaged artisans, and an ambitious undertaking to save the llama industry in Bolivia by providing training an market opportunities for llama ranchers. One World Projects pottery Ayacucho Peruvian piggy banks were mentioned on the Today Show on Monday, December 15th. The pottery piggy banks are baked in wood or gas-fired ovens to cure and are painted by hand. There are different styles and choose from and make a great holiday gift. It's been almost a year since we've added an update on our work in Afghanistan. This post is not the easiest to share-yet needs to be shared. A few weeks ago we received some very sad news. The DHL manager we were working with on handling artisan exports was shot and killed along with the other foreigner working at DHL by one of the guards, after he killed them, he killed himself. The weekend before, a South African/British woman was killed while walking on the street in Kabul. The reality of the danger in Afghanistan for the workers who just want to help others or who are striving to improve their lives hit hard. 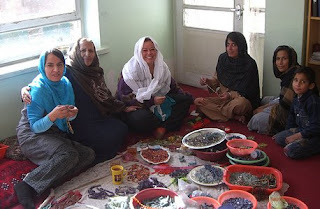 It also made it even more important for us to share the Afghan artisan beautifully hand-made items including jewelry, rugs, shawls and rugs. We will continue our efforts in Afghanistan and keep you updated. Please pray for all those in Afghanistan who are working so hard to improve their lives. This Saturday, May 10, is World Fair Trade Day. To celebrate, the Fair Trade Resource Network is organizing the World's Largest Fair Trade Coffee Break. Participating in the World’s Largest Fair Trade Coffee Break is a great way to communicate the solidarity of the Fair Trade movement in the U.S. and celebrate those who produce the things that we buy. At 3 pm Eastern/Noon Pacific on May 10, 2008, we take a break to enjoy a cup of Fair Trade coffee or other Fair Trade beverage. Anyone can participate, so long as you are serving/consuming Fair Trade beverages that are certified by TransFair USA or produced by a member of the Fair Trade Federation. Invite people to your home. Host an event at your church, synagogue, or mosque. Integrate The Break into your local Farmer’s Market. Fair Trade Resource Network has compiled several resources, including a WFTD Toolkit and WFTD Action Guide and WFTD Media Kit to help you organize your own event. Click here for more information. What's important is that you are counted!! Email your final count of participants, whether its 5 or 500 people, to Sara Stender, FTTowns Coordinator at sara@fairtradetownsusa.org and send your photos, videos, and stories to wftday@fairtraderesource.org. Help us set a new record that will serve as a benchmark for future years’ challenges! 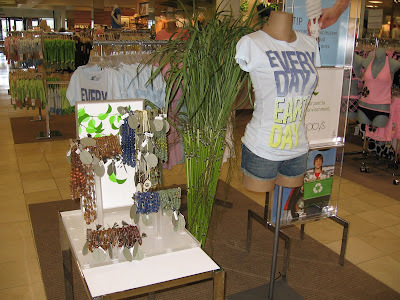 Did you know Macy’s, a large department store chain with stores in 45 of 50 U.S. states, debuted jewelry made with recycled glass beads from Ghana’s Cedi Beads and TK Beads for Earth Day April 22? The two designers shipped beads to One World Products in February and March. We then consolidated them with tagua seed beads from Ecuador and recycled glass beads from Ghana to make globally inspired, environmentally friendly jewelry. Cedi Beads and TK Beads have received training and technical assistance from the West Africa Trade Hub since 2005 and 2006 respectively, and both companies are now striving to increase exports to the U.S.
And of course, you can still visit us at One World Projects for other earth-friendly designs handmade by artisans around the world.